This article is for team owners. If you are a team member, please contact your team leader to discuss your compensation. New investors flock to driving for dollars because it doesn’t cost a lot of money out of your pocket. The cost is your time, the gas in your car, and sending mail. These first two costs are negligible if you’re using a technology during your normal driving. The response rates can be as high as 6 calls back for every 50 postcards you send out. Since you’re hand-picking the properties, the list is highly targeted. Combine that with the high response rate and low out-of-pocket cost, it’s not hard to see how your ROI can exceed other lead sources. So, how much can a driving for dollars technology impact your business? 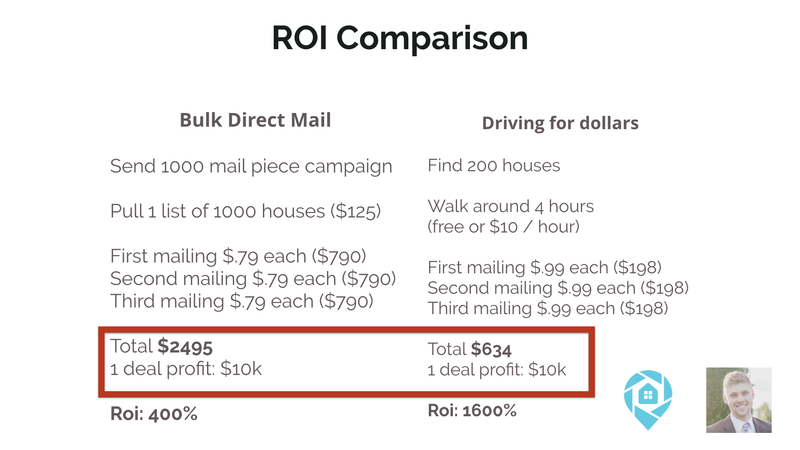 Comparison: Many investors would be very happy to get 1 deal for every 1000 properties they mailed to. That costs about $125 to download a list of 1000 properties. Then an additional $790 each time you mail them. Let’s say you mail them 3 times. That’s $2495 to get one $10k deal, making the ROI 400%. That’d be truly excellent. Versus: Driving for dollars allows you to compile your own list of properties based on the houses you see that meet your criteria — especially those properties you can clearly see are abandoned or run down — meaning the owner may want to sell. You’ll have less competition reaching this list of unique owners, and because of that, we’ve found it takes about 100-200 properties to find 1 wholesale deal that yields $10k on average, when you’re adding properties consistently. If it costs $1 per mail piece, sending 100-200 properties 3 times each would cost $300-$600. That puts your ROI for each deal in the 1600%-3300% range. Recommended goal: Find 200 properties as soon as possible. Set repeat mail for every 21 days. Let the mail repeat for at least 3 times. That is what it takes to get 1 deal on average across the US. Start adding properties during your team’s normal commutes to turn these high ROI deals into a consistent stream of $10k extra per month. Step 1: Download DealMachine. 2: Start your free trial. 3: Start adding deals to DealMachine!